There are some who would call us Italians from the north, and in particular from the Veneto region in the north-east, polentoni. That is because we eat a lot of polenta, and we eat it often. My nonna, who was born in Veneto, made polenta most days to feed her five children. She would cook the polenta on the stovetop and then tip it onto a large round board, so that it could be easily sliced. It was quite a firm version of polenta, made just by adding water and salt, and was used in place of bread. And it was white, a beautiful white with occasional flecks of brown. The family except for my uncle Fidenzio (known as Fide) all loved polenta. He hated it that much that in a rage one day, when his mother had served up polenta on a wooden board again, he gave the steaming hot mound a hard slap with his right hand. You can well imagined what happened next…a blistered hand and utter silence when polenta was served up the following day! When Fide migrated to Australia in the early 1950s (see the photo of him above at Station Pier, with my mother going through a bag and next to him), I don’t think was very easy to find flour to make polenta with here. Polenta (or cornmeal NOT cornflour) is still not that easy to find, in particular the white variety and superfine yellow polenta, which I use to make cakes and sweets. I am starting a series of polenta blog posts with recipes, to tell you more about this rather wonderful ingredient – which happens to have no gluten in it (so great for those with this intolerance). The recipe I am posting here is for simple biscotti made with 50% fine polenta. I made them using the Marcato biscuit maker, which I purchased a few weeks ago. The recipe is an adaptation of the alternate base-recipe that is in the booklet that comes with the device. You don’t need this biscuit (or cookie) maker to make these biscotti, you could easily use a cookie-cutter to make a pretty shape. These biscotti are delicious with a cup of coffee – they are not too sweet and are also great for dunking. Best of all, they are mixed by hand, so really easy to make. I bet my zio Fide (now sadly passed away) would have loved these biscotti, with their combination of orange and lemon zests, even if they do contain his much-hated polenta! A quick update on my cooking classes: classes in Melbourne for the first half of 2016 are also up (click HERE) and there are a few places left for my final Chewton long lunch cooking class on Sunday 22 November – it will be a 4-course Italian extravaganza not to be missed (hand-rolled grissini, mini-zuccotto and ricotta gnocchi with spring vegetables are on the menu so far…)- click HERE for more details. Place the flour, cornmeal, salt, zests and sugar in a large bowl and give them a good whisk to combine. Put the yolks and vanilla in a bowl and give them a quick whisk and add them to the dry ingredients, mixing with a fork. Melt the butter in a microwave until it is just liquid, add this to the mixture, then the milk, and start working the dough with your hands until it is homogenous and smooth. preheat the oven to 180C. 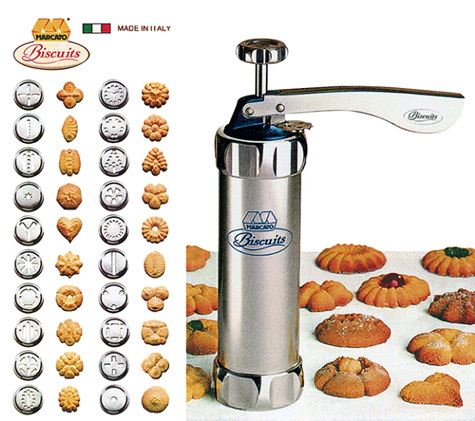 Using the Marcato biscuit-maker or small cookie-cutters, make small circles of dough and place them on baking paper on oven trays. Bake for 20 minutes until golden. Allow to cook on the baking trays. Serve with a dusting of icing sugar. These biscotti keep in an air-tight container for about a week. I’m not a big fan of polenta, but these look great. Paola, I adore polenta and look forward to more wonderful insight from you. This is absolutely the type of cookie I enjoy. Love the shape of those biscuits: they are really cute! Your posts and recipes are wonderful.